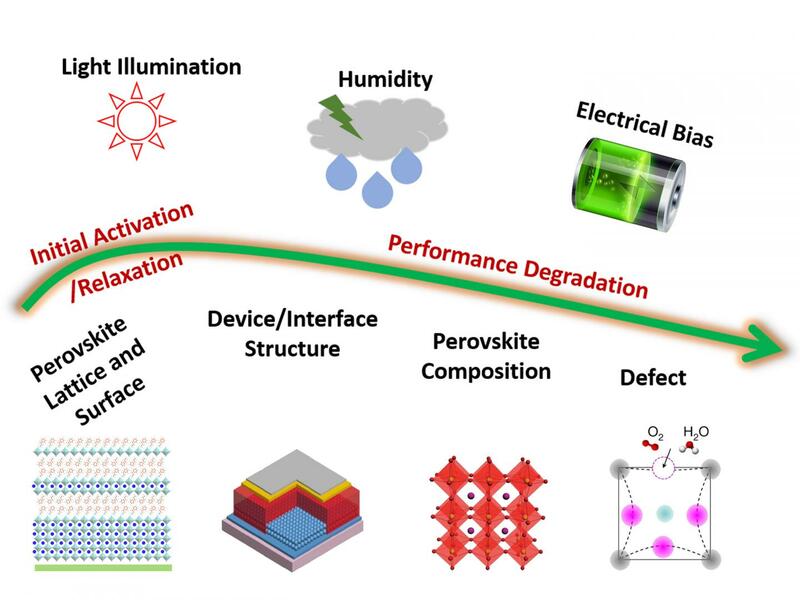 With efficiency of perovskite solar cells (PSCs) overpassing 23%, to realize their commercialization, the biggest challenge now is to boost the stability to the same level as conventional solar cells. Thus, tremendous effort has been directed over the past few years toward improving the stability of these cells. Various methods were used to improve the stability of bulk perovskites, including compositional engineering, interface adjustment, dimensional manipulation, crystal engineering, and grain boundary decoration. Diverse device configurations, carrier transporting layers, and counter electrodes were investigated. To compare the stability of PSCs with clarifying the degradation mechanism, diverse characterization methods were developed. Overall stability of PSCs has become one central topic for the development of PSCs. Recently, a review article, written by professor Zhijun Ning from Shanghai Technological University, Professor Hongwei Han from Huazhong University of Science and Technology , Professor Qingbo Meng from Institute of Physics, Chinese Academy of Sciences, et al. summarizes the state-of-the-art progress on the improvement of device stability and discusses the directions for future research, hoping to provide an overview of the current status of the research on the stability of PSCs and guidelines for future research. The authors tell us that although considerable improvement in the stability of PSCs has been realized, particularly using carbon electrodes, the combination of long-term stability and high efficiency still remains unsolved and needs intensive effort to address this challenge. As for perovskite materials, the exploration of surface terminal groups to prevent the formation of dangling bonds is an important strategy. Considering the large amount of molecules that can be investigated, it is a promising direction to search for new molecules that can better protect the perovskite surface. In terms of device stability, the use of alternative electrodes, such as carbon paste and oxides, provides another strategy to avoid the abovementioned problems. For this structure, the challenge now might be to improve the efficiency. Strategies, such as improving the conductivity and reducing light loss, can be considered. For characterizations, Understanding the mechanism via comprehensive and effective characterization is the basis for improving the stability. The mechanism for device degradation is complicated, particularly under electrical field and light illumination. Different methods have been employed to test the stability of PSCs, leading to a lack of reliability or comparability among the reported results; this is another issue. Therefore, commensurable protocols must be developed for evaluating the stability of PSCs. Developing standard test protocols is the first step toward realizing fast and reliable development in this area.